With the Summer Term now in full swing, we have important updates regarding external moderation, assessment, events, funding and more. You can read more on our new blog – bookmark it to keep up to date with all news and developments as they happen. With lots of events coming up, don’t forget to connect with one another via the UAL Awarding Body Facebook pages and share what you’ve been up to. UAL Awarding Body is in the final stages of designing a new assessment approach for all its Level 3 Diplomas and Extended Diplomas, including the L3 Foundation Diploma in Art & Design. This approach will satisfy the Department for Education’s requirements for ‘appropriate assessment’ as set out in their ‘Technical Guidance’ documents. The focus remains on the Final Major Project (FMP), but introduces a new externally assessed component based around the evaluation of the FMP in the Level 3 Diplomas, and the project proposal in the Level 3 Extended Diplomas and Foundation Diploma in Art & Design. Internal assessment and external moderation will remain for a significant proportion of the FMP. This approach has been designed in consultation with the awarding body’s approved Centres via a consultation event at Central Saint Martins and subject specific focus groups at Chelsea College of Arts. We will test this approach with the DfE in May with a view to making formal submissions in September 2015. Revised versions of qualifications featuring this a approach will be available for first teaching in September 2016, to be reported in performance tables in 2018. UAL Awarding Body is not making any changes to its Level 2 qualifications. They will continue to be assessed via internal assessment and external moderation. This means they will not feature on performance tables. Consultation to date suggests this is unlikely to be an issue for Centres, but we will monitor this position and review it if necessary. Those Centres without a date for a qualification following the 28th April, will be automatically allocated a date selected by the Awarding Body. External Moderators: We are in the process of finalising allocations and will be in touch to notify all External Moderators of proposed visits shortly. A call-out for this year’s summer exhibition has been sent to all centres delivering Art & Design and Creative Media courses. The Deadline for submission is 2 June 2015. UAL Awarding Body organises workshops for Centre staff involved in the delivery of its qualifications, providing the opportunity for tutors to share best practice and ideas for delivery with one another and consult awarding body staff (Chief Examiners/Senior External Moderators). 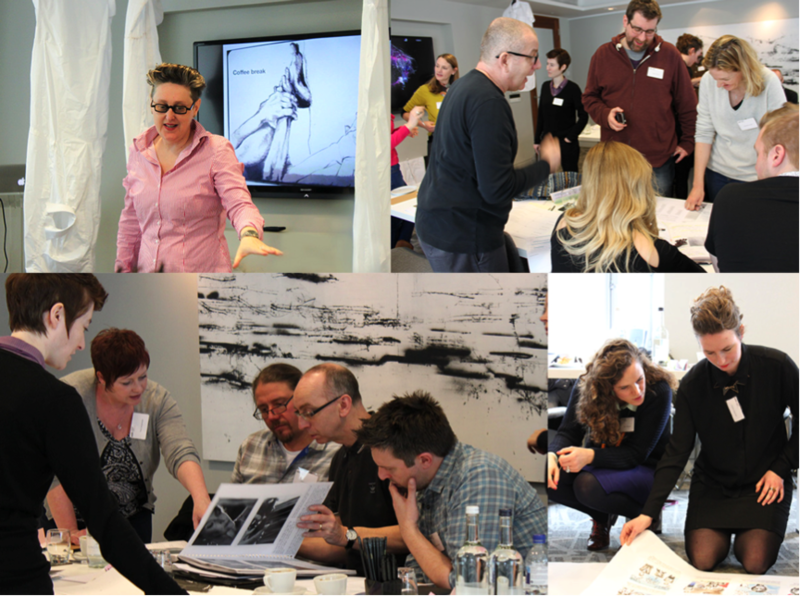 A big “thank you” to everyone who attended UAL Awarding Body’s first two continuing professional development events this March and April. People travelled from far and wide to spend two very different days with us developing skills and teaching strategies to support UAL qualifications and get the best out their students. Creating distinction level projects ran in London and focused on raising the ambition and creative range of projects for UALAB qualifications. The day was delivered by two of our most experienced moderators and involved a mixture of presentations, group and plenary discussions. Participants also got stuck into mock assessment workshops looking at sample student work and mapping to grading criteria. What is drawing? Fostering experimental working, risk-taking and independent learning ran outside of London at Nottingham College of Art; many thanks to the supportive staff there. 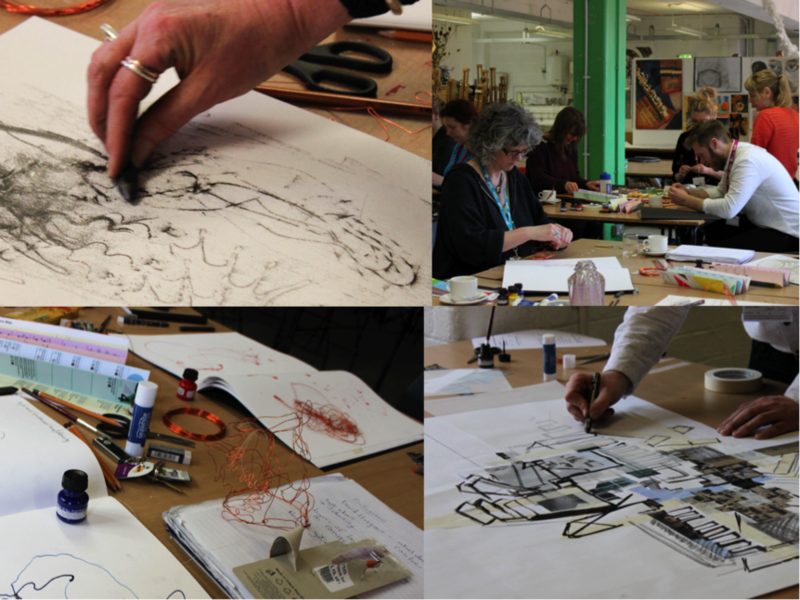 Participants spent the day developing drawing techniques, both for their own sake and exploring a range of applications for UALAB qualifications. 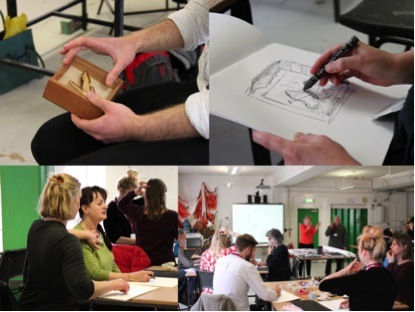 A professional drawing tutor guided participants through challenging and unusual drawing exercises. We made 3D constructions built up a take-home sketchbook for each participant documenting the day. A UAL Senior Moderator was on hand throughout linking to the specifications and student attainment. Feedback from both sessions was very positive, with people saying they really got a lot out of each day. People have now been provided with logins to UAL’s VLE for the sessions, so that they can stay in touch, access materials and downloads of their work from the day. University of the Arts London, of which UAL Awarding Body is part, has reinforced its own commitment to delivery of the Foundation Diploma in Art & Design, aiming to bring its Foundation offer under one roof from 2020 to serve all its colleges. Part of a review of how Foundation is taught at the university, these plans are designed to safeguard Foundation provision following government cuts to further education. The qualification will no longer be delivered at London College of Communication, where it is not a prerequisite of entry to many undergraduate courses. The reach of this qualification has been considerable since its accreditation in 2007, with nearly 8,000 students each year studying the UAL Foundation Diploma in Art & Design at over 50 high-quality institutions across England. This helps students from a wide range of backgrounds progress to higher education in art and design and related subjects. Annual progression rates are always in excess of 90%, with almost all students who want to go on to higher education doing so. Following extensive consultation the grade criteria exemplification matrices are now available on the UAL Awarding Body website. The matrices should be used to support internal assessment and external moderation of graded units. We will be carrying out an evaluation of the matrices during the external moderation cycle between May and July 2015. 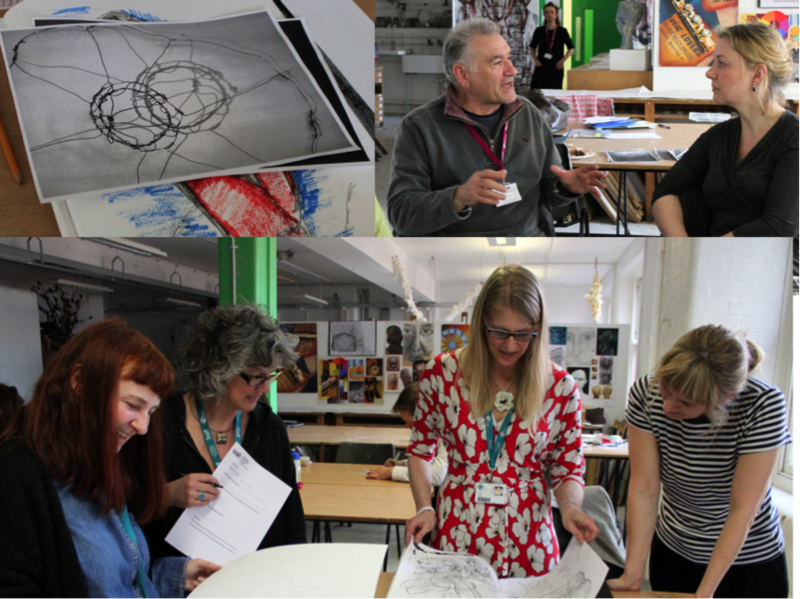 We are pleased to confirm that we have received confirmation from the Skills Funding Agency (SFA) that the UAL Level 4 Art & Design – Foundation Studies is approved for funding for 19+ learners for the academic year 2015/16. A guide explaining the external moderation process for Level 2 and Level 3 Performing and Production Arts can be found on the UAL Awarding Body website.